Sears was an early supporter of Atari, and they sold Atari merchandise under their own brand name. 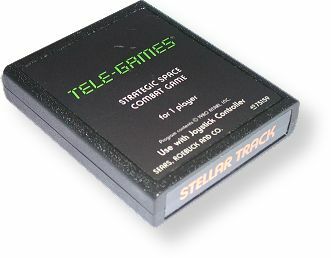 This included both hardware and software, and the Sears version was called Sears Tele-Games. All but three Sears games are simply repackaged Atari games (Steeplechase, Stellar Track, Submarine Commander). Sears cartridges can be found in Text and Picture varieties, and they are very similar to the Atari versions. Sears also released the first nine Atari games in unique gatefold boxes, but they did not make numbered labels like Atari did. Sears Text labels are black with TELE-GAMES in large font, followed by a listing of games on the cartridge. Some people mistakenly call these 'multi-carts', but they are just game variations and not any different from the Atari version. Many Sears cartridges can be found in both Text and Picture variations. Records Found: 58 Click on a column header to sort by that column. Click again to reverse sort order.